Exchange Server 2007/2010/2013/2016 is a common Windows email server. DKIM is a method for associating a domain name to an email message, thereby allowing email sender claims some responsibility for the email. 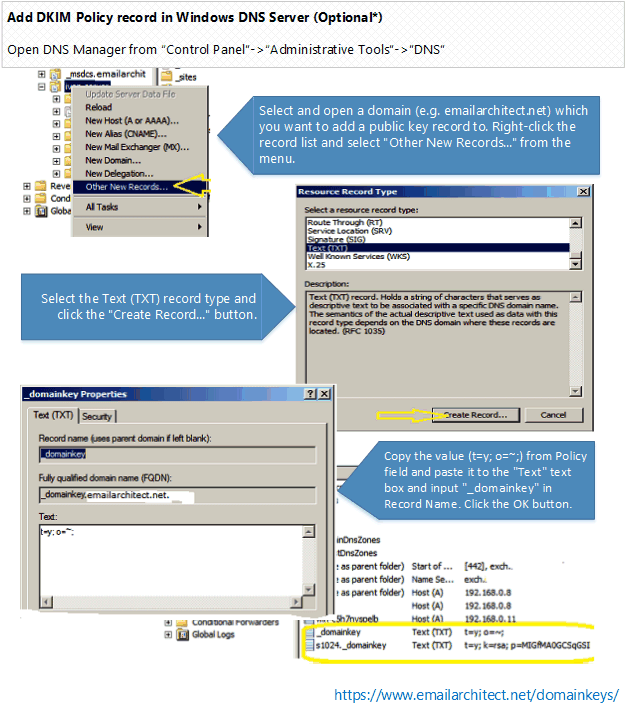 In this topic, I will introduce how to add DKIM signature to outgoing emails in Exchange Server 2007/2010/2013. I will also introduce DKIM selector and sender rule usage. Because DKIM signer uses private key to sign the email, recipient system uses public key to verify the signature, therefore, if signer doesn't expose the private key to third-party, the DKIM signature cannot be faked. To enable DKIM signature in Exchange Server 2007/2010/2013, you should download the DKIM Installer and install it on your machine at first. 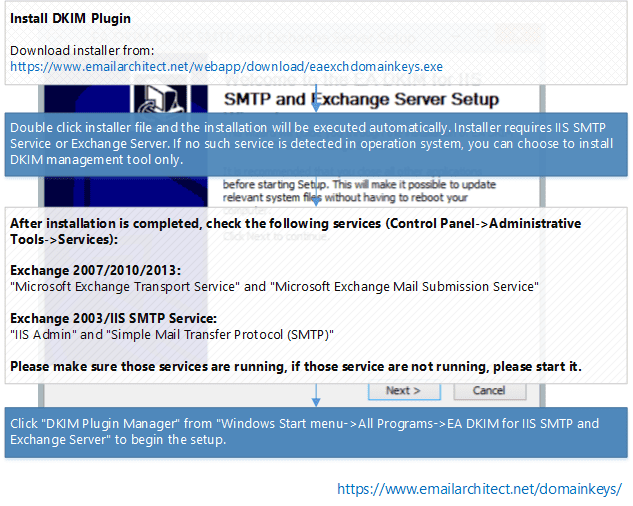 After the installation is complete, click "DKIM Plugin Manager" from "Windows Start menu-&gt;All Programs-&gt;EA DKIM for IIS SMTP and Exchange Server" to begin the setup. Exchange Server on multiple servers. 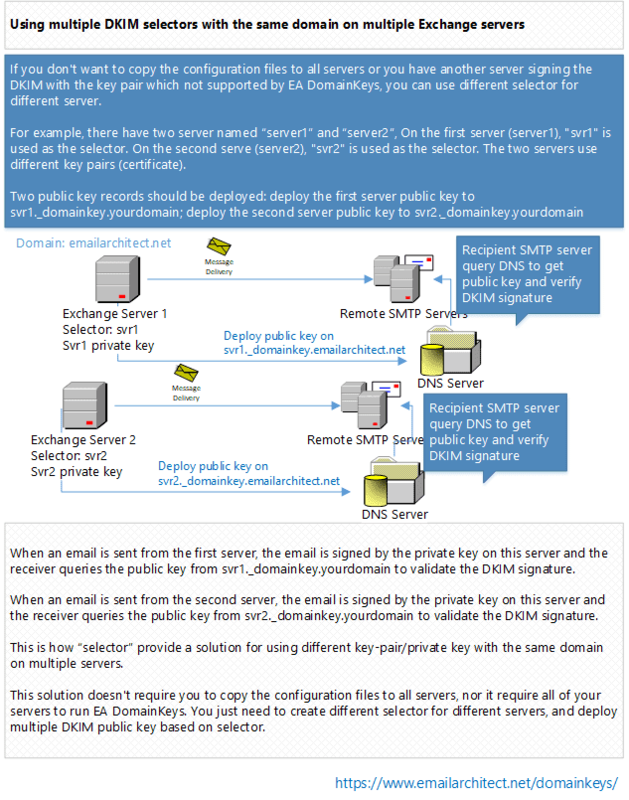 If you installed Exchange Server 2007/2010/2013 on multiple servers, you don't have to install DKIM plugin on every server. If there is Exchange Edge Transport Server Role installed, you just need to install DKIM plugin on this server. If there is no Exchange Edge Transport Server Role installed, you just need to install DKIM plugin on every Exchange Hub Transport Server Role. Click "Domainkeys/DKIM" in Manager and click "New" to create a new domain DKIM signature. DKIM signature is based on the domain of sender email address. It is nothing about the Exchange server name. For example, if you want to sign the email from *@emailarchitect.net, please input emailarchitect.net to Sender Domain. You can simply input your sender domain, use default settings for other parameters, finally click "Save" to create your DKIM signature. DomainKeys/DKIM signature is based on the domain of sender email address. It is nothing about your server name. For example, if you want to sign the email from *@emailarchitect.net, please input emailarchitect.net to Sender Domain. To support multiple concurrent public keys per sending domain, the DNS namespace is further subdivided with "selectors". Selectors are arbitrary names below the "_domainkey." namespace. To learn more detail, please refer to Selector section. For a new domain, you can simply use the default value "s1024". If you have this option unchecked, DomainKeys/DKIM for this domain will be disabled. Default value is: Both DKIM and DomainKeys. You can also choose "DKIM Only" or "DomainKeys Only". We strongly recommend that you select "Both DKIM and DomainKeys". On Windows 2000/2003/XP, rsa-sha1 is the only option. On windows vista/7/2008 or later version, you can choose "rsa-sha1" or "rsa-sha256". "rsa-sha1" gives better performance while "rsa-sha256" is more secure. "rsa-sha1" is recommended. If you have another server using our DKIM software to sign the same domain and it uses the same selector, you need to copy the certificate from that server and use the same certificate. Please refer to: Deploy DomainKeys/DKIM on multiple servers with same domain. Specify what message headers should be signed. "sender" header and "from" header are a MUST. Using default setting is recommended. Finally you can send an email to this email address from your Exchange server, please make sure your sender address is belong to this domain, otherwise, DKIM signature won't be signed. A DKIM report will be generated in a short time. Because you didn't deploy DKIM public key to DNS server, so you will get an error about "no key". 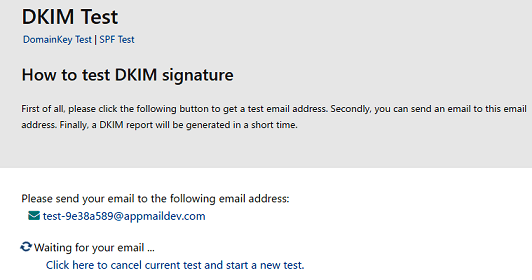 But if there is a header named "DKIM-Signature" in the report, that means DKIM signature is added to your email. Now we need to deploy DKIM public key to your domain DNS server. If your domain is hosted by Windows DNS Server in local LAN. After you added a domain in DKIM Plugin Manager, you can select the domain and click "Deploy Key", input your DNS server address and choose the DNS zone, the public key will be deployed to DNS server automatically. 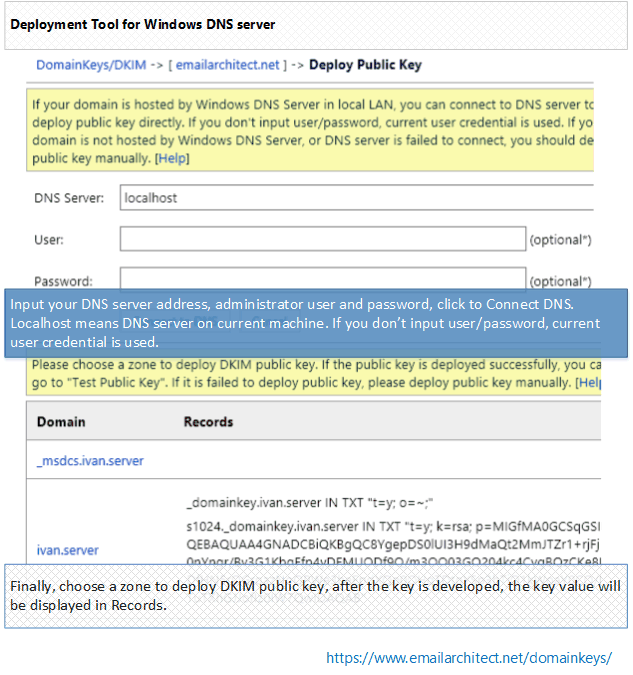 If your domain is not hosted by Windows DNS server in local LAN, or it is failed by "Deploy Key" in DKIM manager, you can select the domain and click "Export Public Key". A dialog box will pop up and display a Public Key and a TXT record for deployment in your DNS server. The value in the record. "t=y;" in public key record means Test mode, you can remove "t=y;" from your public key record after your DKIM/DomainKeys test is finished. 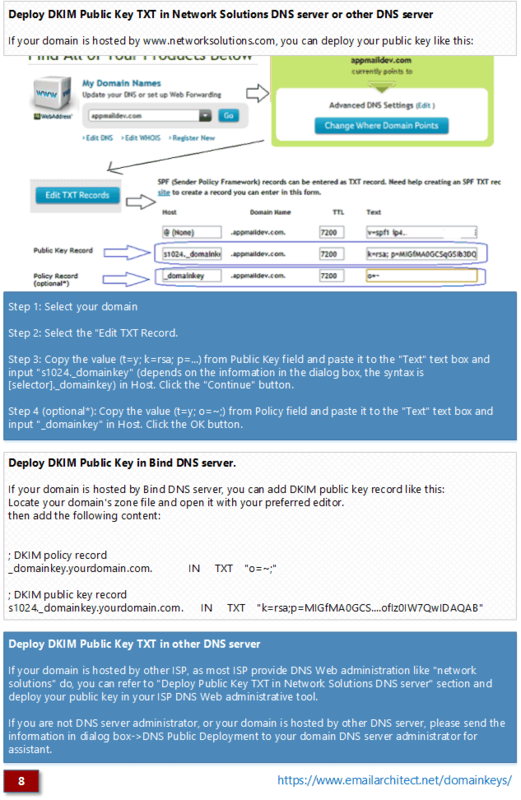 Domain Policy Record is always deployed to _domainkey.yourdomain. 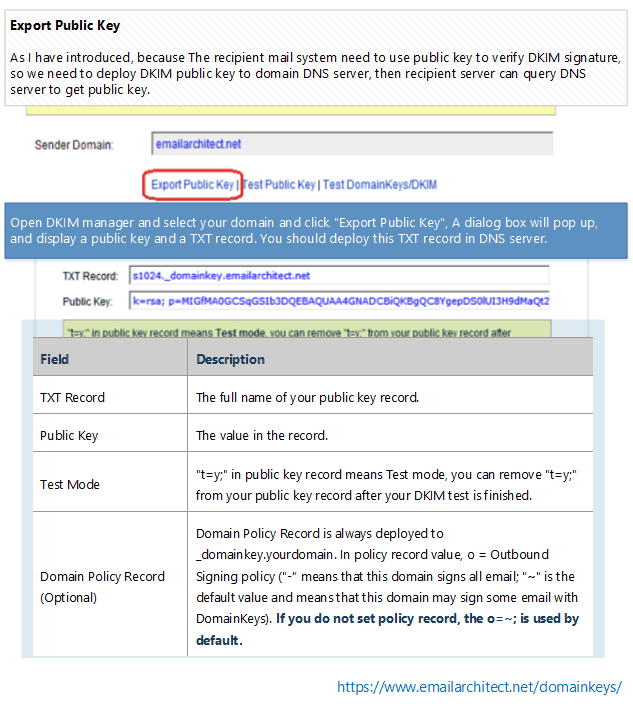 In policy record value, o = Outbound Signing policy ("-" means that this domain signs all email; "~" is the default value and means that this domain may sign some email with DomainKeys). If you do not set policy record, the o=~; is used by default. Step 1: Select and open a domain (e.g. 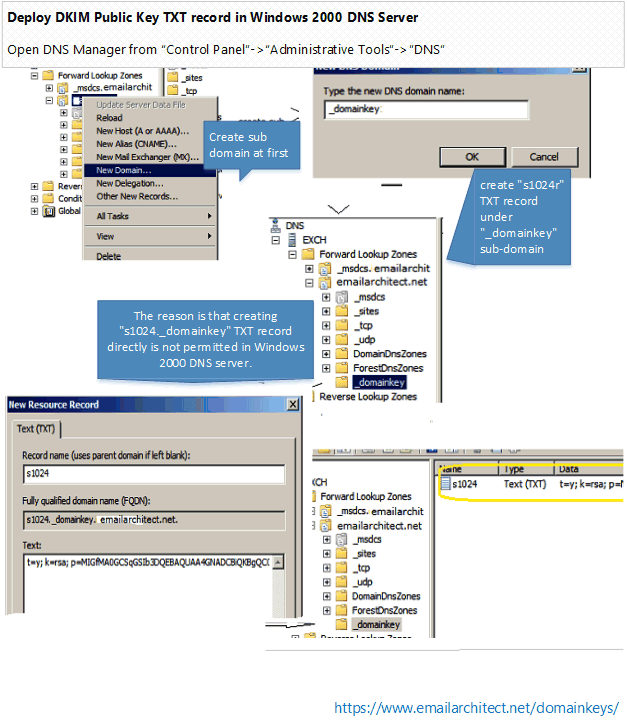 emailarchitect.net) which you want to add a public key record to. Right-click the record list and select "Other New Records..." from the menu. Step 3: Copy the value (t=y; k=rsa; p=...) from Public Key field and paste it to the "Text" text box and input "s1024._domainkey" (depends on the information in the dialog box, the syntax is [selector]._domainkey) in Record Name. Click the OK button. If you're using Windows 2000 DNS server, you should create "_domainkey" domain under "your domain" at the beginning, and then create "s1024" TXT record under "_domainkey" sub-domain. The reason is that creating "s1024._domainkey" TXT record directly is not permitted in Windows 2000 DNS server. Step 3: Copy the value (t=y; o=~;) from Policy field and paste it to the "Text" text box and input "_domainkey" in Record Name. Click the OK button. *This record is optional, you don't have to add it. If you do not set policy record, the o=~; is used by default. 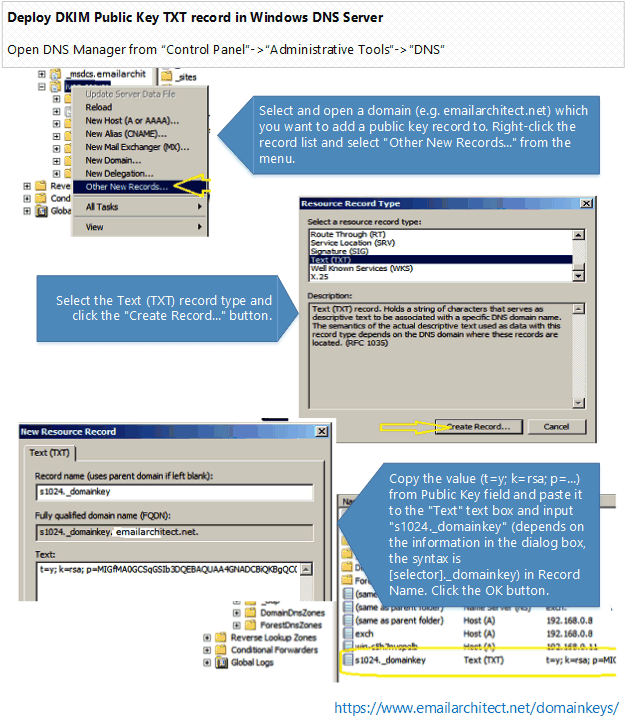 Step 2: Select the "Edit TXT Record. Step 3: Copy the value (t=y; k=rsa; p=...) from Public Key field and paste it to the "Text" text box and input "s1024._domainkey" (depends on the information in the dialog box, the syntax is [selector]._domainkey) in Host. Click the "Continue" button. Step 4 (optional*): Copy the value (t=y; o=~;) from Policy field and paste it to the "Text" text box and input "_domainkey" in Host. Click the OK button. If your domain is hosted by other ISP, as most ISP provide DNS Web administration like "network solutions" do, you can refer to "Deploy Public Key TXT in Network Solutions DNS server" section and deploy your public key in your ISP DNS Web administrative tool. If you are not DNS server administrator, or your domain is hosted by other DNS server, please send the information in dialog box->DNS Public Deployment to your domain DNS server administrator for assistant. Click "Next Step", you will get a test email address. Finally you can send an email to this email address from Exchange Server, please make sure your sender address is belong to this domain, otherwise, DKIM signature won't be signed. A DKIM report will be generated in a short time. Check your email sender, please make sure your from address is *@yourdomain, and you have set the domain in DKIM. As DKIM signature is based on the email sender, if the sender domain is not set in DKIM Manager, the email won't be signed. When you install DKIM on Exchange Server 2007/2010/2013, please make sure you are using "Domain Administrator" user to run the installer. If you installed EA DomainKeys on Exchange 2007/2010/2013, please open Exchange Management Shell. Please check if there is "EA DomainKeys Agent" installed in the output. It is likely that the MTA changed email content (disclaimer software or anti-virus software). Please go to DKIM setting, check "Sign a part of message" and set "Maximum length of message body to sign" to zero, then try it again. If your email has DKIM-Signature header, but it couldn't be verified by this online tool, you should go to DKIM setting and test your public key again to make sure your public key is ok. If your public key is ok, please contact support@emailarchitect.net for assistance. 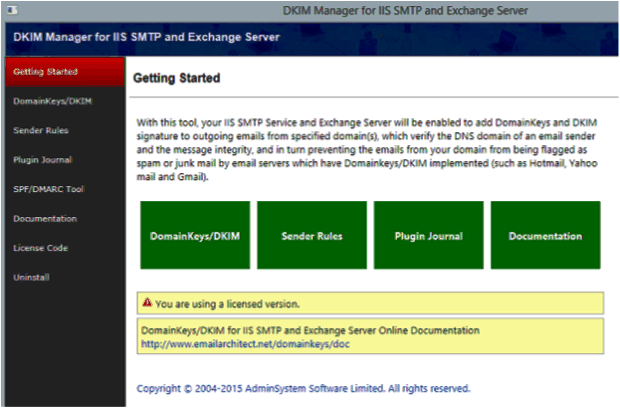 Now Exchange Server 2007/2010/2013 can add DKIM signature to outgoing emails from your domain. If you want to send email from other domain, you can simply add the domain from DKIM manager. To support multiple concurrent public keys per sending domain, the DNS namespace is further subdivided with "selectors". Selectors are arbitrary names below the "_domainkey." namespace. For example, selectors may indicate the names of your server locations (e.g., "mta1", "mta2", and "mta2"), the signing date (e.g., "january2005", "february2005", etc. ), or even the individual user. The most important thing is: selector indicates your DKIM public key location. For example: if your domain selector is: "s1024", your public key record will be "s1024._domainkey.yourdomain"; if your domain selector is: "mta1", your public key record will be "mta1._domainkey.yourdomain". If you have only one server and you only set the DKIM/DomainKeys on this server, you can give your selector any name. For example: your domain name is: "emailarchitect.net" and your selector is: "s1024", you should deploy your public key to "s1024._domainkey.emailarchitect.net". 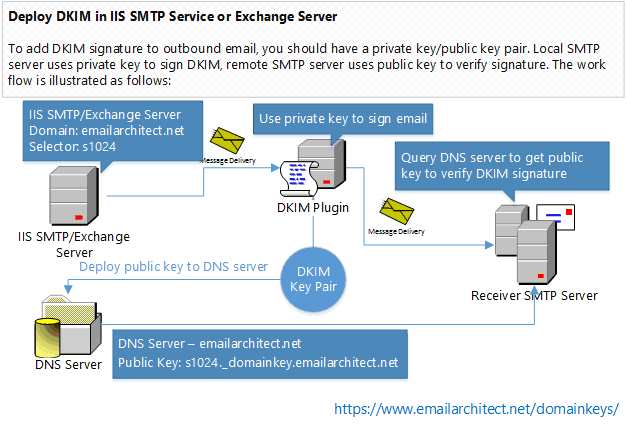 After the receiver received your email, the receiver can query the public key from "s1024._domainkey.emailarchitect.net" to verify your DomainKeys/DKIM signature. If you have only one Exchange server, you can skip the followng sections. If all of your servers are running with EA DKIM, you should deploy the certificate as follows: First of all, install EA DKIM on the first server, and create the certificate for the domain. Then install EA DKIM on other servers, and copy the *.pfx certificate you created on the first server to other servers under EA DKIM installation path\certs. Finally, when you create the DomainKeys/DKIM on other server, please have "I have a key pair certificate ..." selected, and import the *.pfx file from your local disk and input the "TMP001" (default password) as the password. All of your servers will have the same certificate (private/public key pair) for your domain. Please also make sure you use the same selector "s1024" (default name). Since the private/public key pair is stored in the certificate, if you use the same selector/certificate for the same domain on multiple servers, all servers will use the same key pair for this domain. You just need to deploy the public key to "selector._domainkey.emailarchitect.net", every email from multiple servers can be verified by this public key. 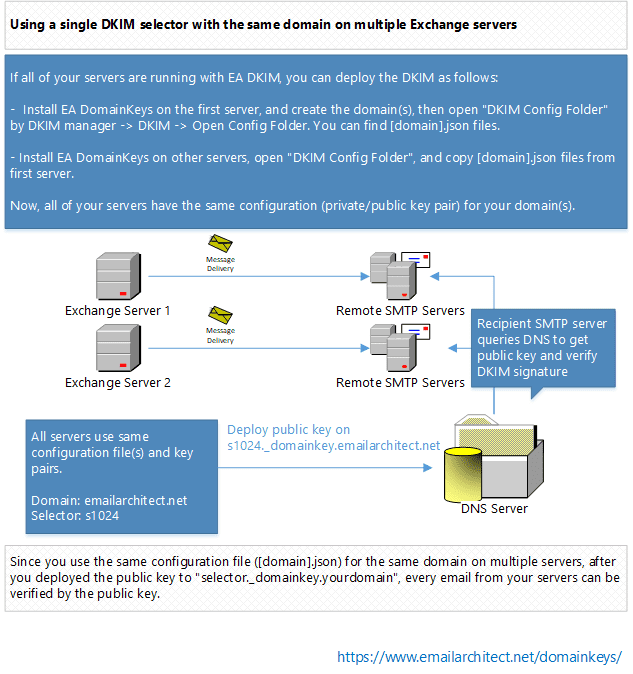 If you don't want to copy the certificate to all servers or you have another server signing the DKIM with the key pair certificate not supported by EA DomainKeys, you can use different selector for different server. For example, there have two server named “server1” and “server2”, On the first server (server1), "svr1" is used as the selector. On the second serve (server2), "svr2" is used as the selector. The two servers use different key pairs (certificate). When an email is sent from the first server, the email will be signed by the key pair (certificate) on this server and the receiver will query the public key from svr1._domainkey.yourdomain to validate the DKIM signature. This is how “selector” provide a solution for using different key-pair/certificates with the same domain on multiple servers. This solution doesn't require you to copy the certificate to all servers, nor it require all of your servers to run EA DKIM. You just need to create different selector for different servers, and deploy multiple DKIM public key based on selector. Sometimes you need to send an email with sender address not hosted by your server. In this case, you cannot set DKIM signature for such email, as you don't have permission to deploy the DKIM public key to the domain not hosted by your DNS server. If you don't send email from outside email address, or you don't need to sign the DKIM for those emails, you can simply ignore this topic. Here is the scenario. You own a domain "emailarchitect.net" and you have DKIM/DomainKeys for "emailarchitect.net" set on your server. There is no problem when you send emails with sender "*@emailarchitect.net", the email will be signed correctly. At the same time, your customer requested you to send emails with sender "*@adminsystem.com" and sign the DKIM/DomainKeys signature for outgoing emails. As "adminsystem.com" is your customer domain and you don't have permission to deploy the public key to "adminsystem.com" DNS server, you have to use sender rule. To solve the problem, you can add a sender rule like the above screenshot. This rule means "If from addess is *@adminsystem.com, then add a sender header (Sender: testuser@emailarchitect.net) to the message". And the email will be signed by "emailarchitect.net" based on the sender header. 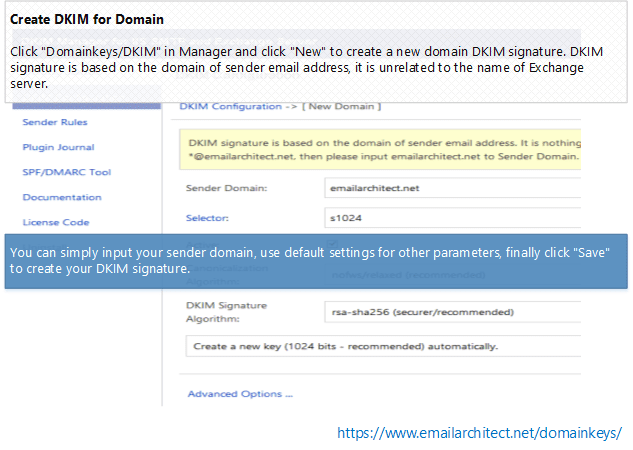 With the above sender rule, the email will be signed by DomainKeys/DKIM signature with domain "emailarchitect.net". And the recipient email client will display "From: testuser@emailarchitect.net on behalf of *@adminsystem.com". For example, if you set "emailarchitect.net" in DKIM setting, and add a rule like this: "if From contains *@emailarchitect.net", then ...". 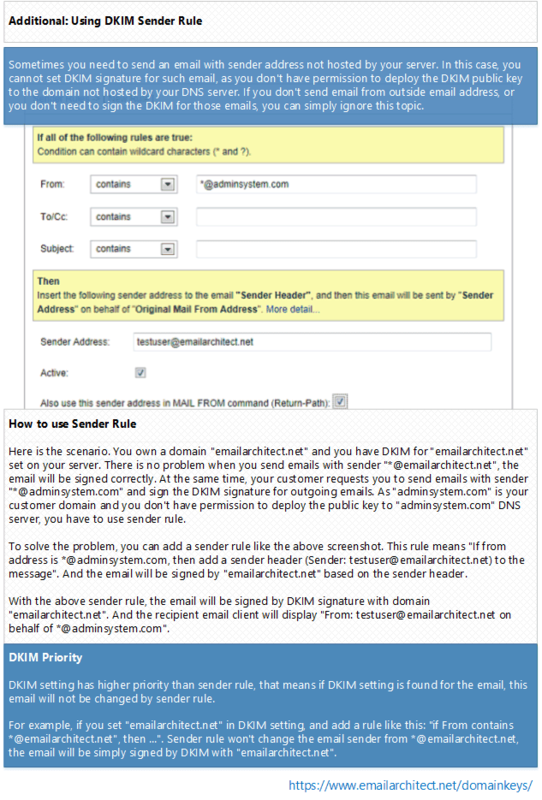 Sender rule won't change the email sender from *@emailarchitect.net, the email will be simply signed by DKIM with "emailarchitect.net". Any questions, comments and discuss for DKIM in Exchange 2007/2010/2013 is welcome. 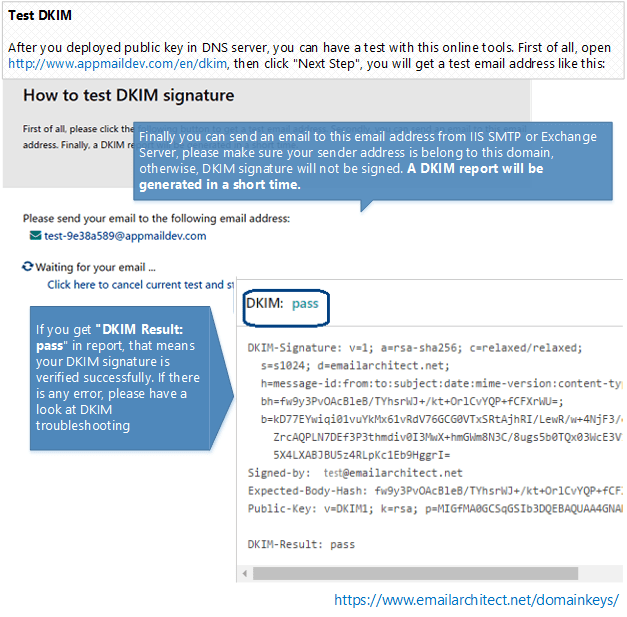 Valid DKIM and DomainKeys signature can get positive points in Anti-Spam system, but it doesn't mean your email can go to recipient inbox at 100% with DKIM signature. Im beginner in DKIM. I understand a deployment in single domain enviroment. Users send emails via this server with self domain email address like user@simbud.co.hu, otheruser@fressnapf.hu i hope it's clear for you what im talking about. DNS servers and records not in my scope but clients can modify own records. My question: how can I make dkim to my clients and where publish public keys. If possible please send me a short step by step guide. First of all, you just need to install DKIM software on your exchange 2010 server. Secondly, create domain "simbud.co.hu", "fressnapf.hu" ... in DKIM manager->DomainKeys/DKIM one by one(there is no limit for domain count), but don't have "active" checked. Finally, in the DKIM manager->[domain]->click "Export Public Key" and send the public key information to your client. After you client modified the DNS server, have "active" checked, then it is ok, you can also use Test Public Key and Test DomainKeys/DKIM to test it. I plan to buy standard license. Yes, it is life-time, but only 12 months free upgrade/support period, after the upgrade period is expired, you just cannot upgrade to the further release, but you current version will work for life-time. You can also choose to purchase upgrade license (30% price) once there is a major upgrade (optional). Yes, you can transfer license to new server very easily. Thank You youar answers. I purchase a standard license via paypal (gyorgy.weibel@.......-). When receive activation code, and where i think registred paypal email address? thanks for purchasing our product. I just sent the license code to your paypal email address, if you didn't receive it, please kindly contact me. We also fully tested it with Exchange 2016, it supports Exchange 2016 very well. An inbound transport agent for DKIM/SPF/DMARC authentication is provided as an optional component. You can use the authentication/verification result to filter the spoofing emails to spam folder, or even you can use it to reject the email in SMTP service directly.